Mumbai Indians will be the 6th IPL franchise Yuvraj Singh will represent. One of the greatest limited overs cricketers of all time, we might’ve seen the last of Yuvraj Singh in an International jersey. The all-rounder though is determined to continue and keep playing cricket at the domestic level. He represented Punjab in just five games in the recently concluded Ranji Trophy and had a forgettable time. Yuvraj was picked up at his base price in the 2019 auction held in Jaipur by the three-time champions Mumbai Indians. Although it’s difficult to see how he might fit in the playing XI, his experience will definitely bolster their strength for the upcoming season. With most international players having World Cup commitments, Yuvraj might end up being one of the pivotal players for Mumbai. In a recent interview, he talked about easing some pressure off Rohit Sharma’s shoulders by contributing in the middle order. Rohit has always had middle-order conundrums due to which he had to take up that responsibility and make others open. With Yuvraj’s presence, Rohit might appear again in the opening slot. “I think, if I can contribute in the middle-order, it will just take some weight off him (Rohit) and he can just go and play his natural game, while opening. (We will) see how the combinations (go). I’m very fired up boss, I have been training in the nets every day,” said Yuvraj as quoted by the Times of India. 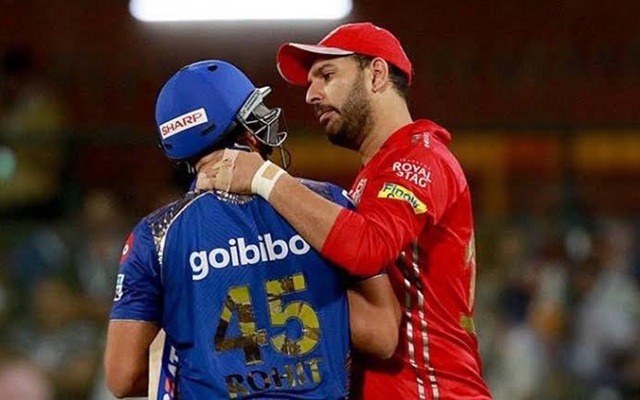 Mumbai Indians will be the 6th IPL franchise Yuvraj Singh will represent, the others being Kings XI Punjab, Pune Warriors India, Royal Challengers Bangalore, Delhi Daredevils and Sunrisers Hyderabad. He was a part of the title-winning side once in 2016 with the Sunrisers under the leadership of David Warner. The star-studded Mumbai Indians line-up will be a major challenge for Yuvraj as he might not get a lot of games to prove his current form. His legendary status will be a bonus and all the youngsters in the side will be having a great time being under this veteran.